The hosts of a popular New Jersey radio show were suspended for 10 days Thursday for calling the nation’s first Sikh attorney general “turban man” — the latest slur against a career prosecutor who says he faces countless “small indignities and humiliations” no matter how far he rises or how important his position.WKXW-FM hosts Dennis Malloy and Judi Franco issued a written apology to Attorney General Gurbir Grewal and the Sikh and East Asian communities, writing they were “deeply sorry” for the pain they caused. The station also apologized and suspended the pair without pay until Aug. 6. The pair continued to refer to Grewal as “turban man” throughout the segment. Neither host responded to emails seeking comment. For Grewal, the son of Indian immigrants, Wednesday’s slights stood out only because the audience for them was bigger. He said he’s been called a “towel head” and a terrorist, and told to “go back home” — Grewal was born and raised in New Jersey — more times than he can count. He said he’s felt eyes on him everywhere he goes. “Throughout my life and regardless of the positions I’ve held, I’ve faced these small indignities and humiliations,” Grewal said in May. And it continued after he took office in January. Grewal said he was invited to give a speech at a corporate office. His staff arrived ahead of him and had no problem gaining admittance. When Grewal showed up, a security guard told him he “wasn’t on the list” and wouldn’t let him through. Grewal said he spent 15 minutes explaining who he was. He was finally let in and delivered his speech — on diversity and inclusion. The Sikh Coalition, a New York-based advocacy group, said the visible markers of the faith — unshorn hair and turbans — have long made Sikhs a target for bigotry and hate crimes. The group on Thursday requested religious and cultural sensitivity training for the radio station’s staff. “These statements against the top law enforcement official in the state of New Jersey are particularly egregious coming from amplified voices of radio hosts, given the prominence of racism and xenophobia against Sikhs across the country,” said Satjeet Kaur, the Sikh Coalition’s executive director. 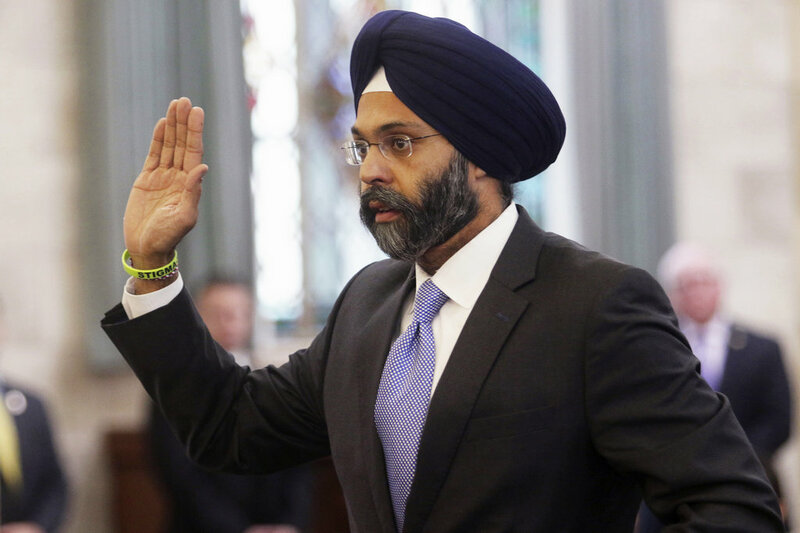 Grewal served as a federal prosecutor in New York and New Jersey before Republican Gov. Chris Christie tapped him to lead the prosecutor’s office in Bergen County, New Jersey’s most populous. Christie’s replacement, Murphy, picked Grewal to be attorney general, saying he wanted a prosecutor who would stand up to President Donald Trump. As attorney general, Grewal has threatened to sue firearms companies unless they stop marketing and selling untraceable weapons; launched an investigation into the Cambridge Analytica privacy scandal; and joined other Democratic attorneys general in suing the Trump administration over the separation of migrant families. Grewal appeared eager to move on from the hosts’ remarks, tweeting later Thursday: “Ok, back to business.” Through his office, he declined an interview request. The “Dennis & Judi” show has been a fixture on New Jersey radio for more than 20 years, and many of the show’s loyal listeners called the station Thursday to protest the hosts’ removal.